Myron Lieberman (1919–2013) was a public school teacher and teachers’ union negotiator turned professor of education. His time within the public school system led him to lament the inflexibility and bureaucracy of the public school system, which, he believed, stemmed from the public school bureaucracy’s immulnity from competitive markets. 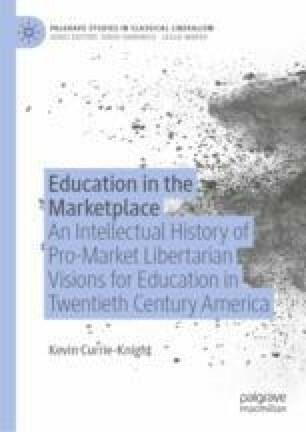 Drawing on a “public choice” approach to economics, Lieberman went on to critique public school systems, arguing not only that models of school choice via markets, but also that school-choice plans should allow and encourage for-profit schools to compete in the educational marketplace.